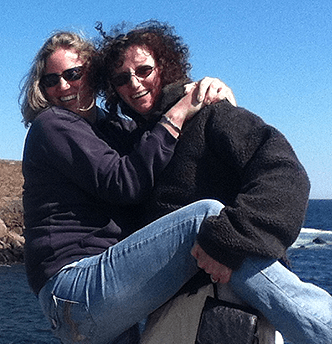 Let me just say as far as sisters go, Chris is the wild one… But I’m the one who lives with the wild animals — and not so wild animals! Photo at left is of my sons. 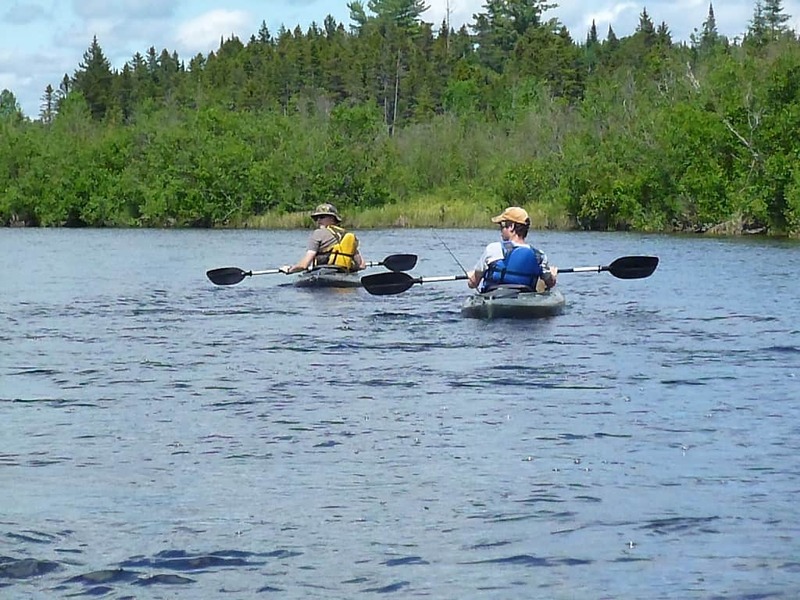 A few weeks ago I went for a fishing/kayaking trip with my guys. I brought a book. Love to kayak, but not so much on fishing. I’ll eat fish; I’ll cook fish; I’ll even flyfish, but I will not clean a fish. Ick! But this post is not about fish. On our ride to the “secret fishing hole”, we saw some amazing animals. The weather was perfect — meaning the bugs were held at bay by a nice breeze and it was warm but not stifling. Perfect! 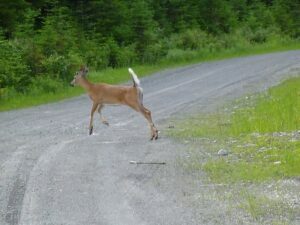 This deer was nibbling in the road. I’m told it was lapping salt deposits. Sounds reasonable to me. Again, I can’t disclose the location, but calcium could be there. I’ll go with that explanation. 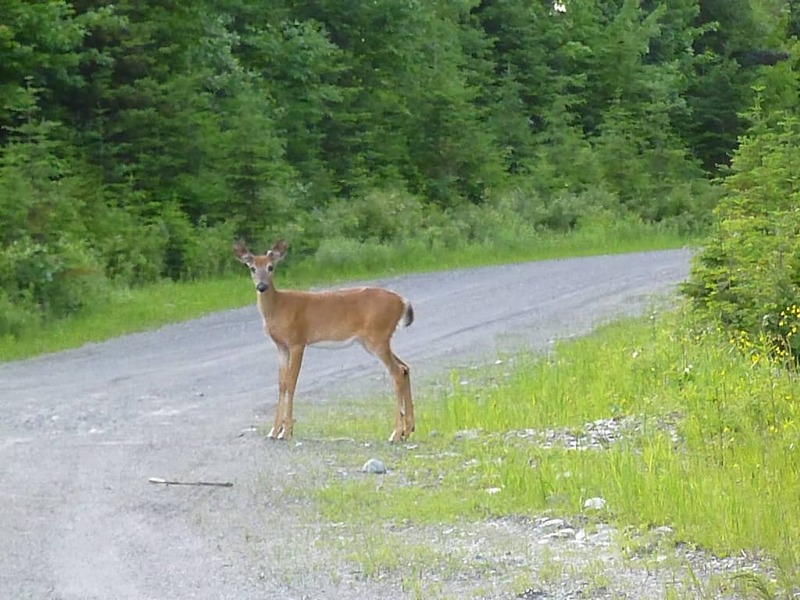 When I see deer, it’s usually the back side of them as they scramble into the woods and I’m struggling to get my camera out. Word to the wise: When riding in animal country, keep the camera out of its case and ready to go! 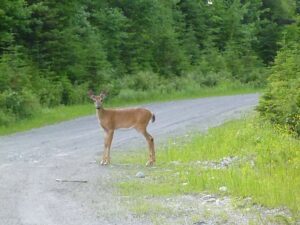 Immediately after this shot, the deer bounded away, but not before I got another shot! Pretty awesome! What a beautiful animal! And see why I say bounded?! 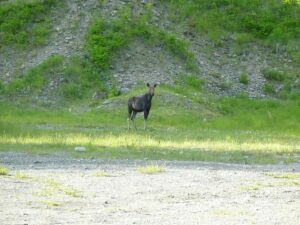 Next we saw a few moose. 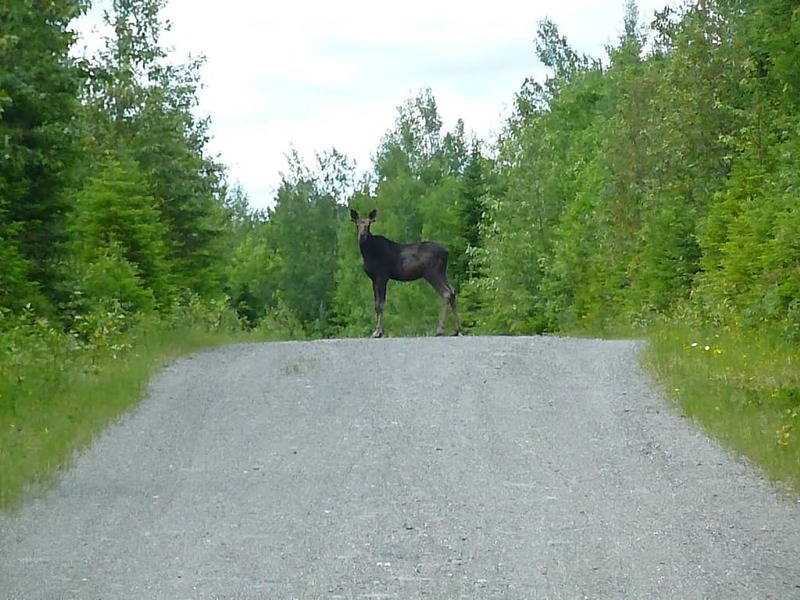 Moose are much slower to “bound”. Actually, I don’t think they do bound! They still dislike human intrusion, so remember to keep the camera ready. 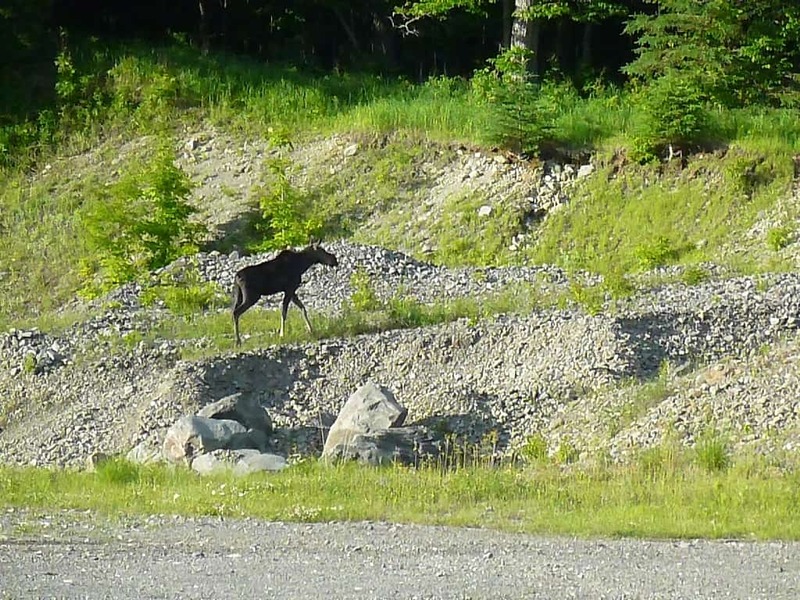 I’m not sure why, but moose love gravel pits. Could it be more calcium on a larger scale than the deer in the road? 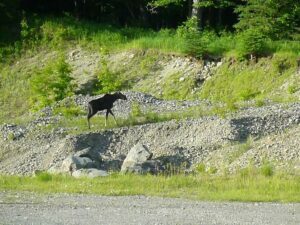 I mean, moose are much larger than deer. Sounds plausible. I’ll go with that as well. Haha! I love this shot of her walking up the slope! And that brings up a great point. Who knows how I can tell female from male? Correct, you are! Males have antlers at this time of year. Most people are familiar with antlers – you see antler chandeliers, antler pull knobs on drawers and cabinets. Obviously, these decorative antlers are from a deer, but moose antlers are used for signs, decorations on mantles, and even a medium for carving. So who thinks the only way to get a set of antlers is by killing the animal? You’d be wrong. Antlers naturally drop off in late winter. I know this because my guys collect them. Someone asked them how many moose they had to kill to get all the antlers they collect. That would be barbaric! So now you know a little trivia and can thank me when you win a million on some tv show. 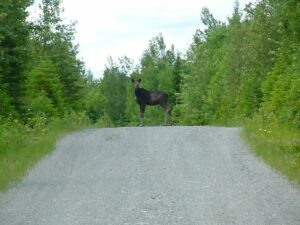 Further on up the road we saw this amazing creature who posed for the camera. It happens. No fear… curious… model. It happens. Sometimes…. I actually got out of the truck, had time to zoom in, and took several shots. To end the day, and this post, I have to include a shot of something wild which doesn’t eat calcium. 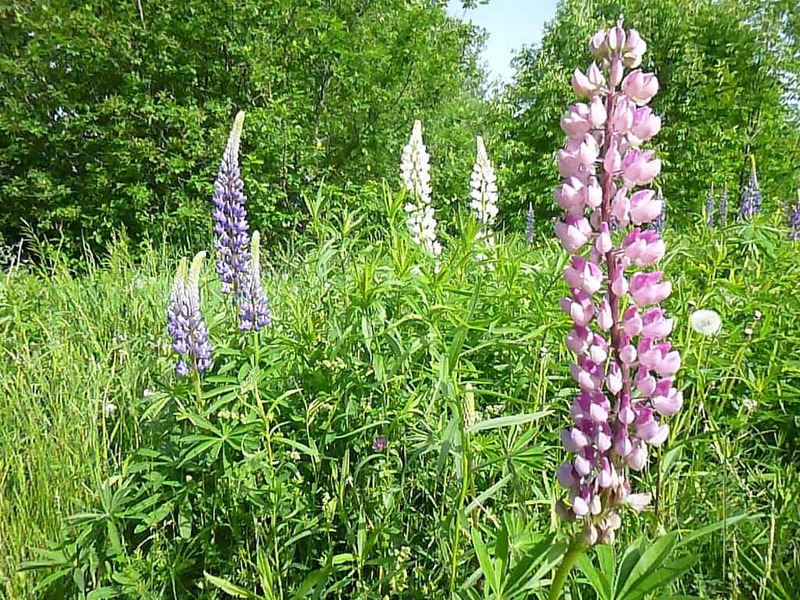 At least I don’t think it does… Lupine! Wonderful LUPINE! It grows everywhere in Maine. Once it goes to seed, it will have big pods that you can collect, bring home, and shake on the ground. 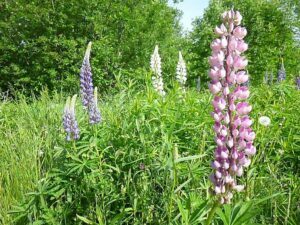 If you’re lucky, you’ll have lupine next summer. This is our mother’s favorite flower but she has the toughest time growing them. You can see why she wants them though. Absolutely beautiful! Where is your favorite fishing spot? Haha, you don’t have to share if it’s secret but we sure would like to know!